Warm amber in colour, there are harmonious aromas of herbs, heather and honey. Taste it and you'll detect a creaminess on the palate, with honey, apple, vanilla and butterscotch notes and a rich, lingering finish. This is whisky that shows well with the addition of just a little water. Award-winning blended whisky (gift box).This rich, smooth whisky balances style with substance and tradition. An artful blend of single malts & delicate grain whiskies, matured for at least 12 years. This blend won a Gold Medal at the International Wine & Spirit Competition (IWSC) 2015. 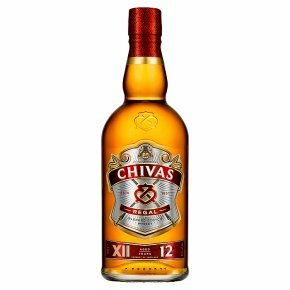 Each whisky in the Chivas Regal range is unique. The founding fathers of the distillery pioneered the art of blending whisky and their traditions have passed down through generations of Master Blenders to preserve the distinct character and quality of every Chivas drop.